Objective To investigate the distribution, design characteristics, and dissemination of clinical trials by funding organisation and medical specialty. Design Cross sectional descriptive analysis. Data sources Trial protocol information from clinicaltrials.gov, metadata of journal articles in which trial results were published (PubMed), and quality metrics of associated journals from SCImago Journal and Country Rank database. Selection criteria All 45 620 clinical trials evaluating small molecule therapeutics, biological drugs, adjuvants, and vaccines, completed after January 2006 and before July 2015, including randomised controlled trials and non-randomised studies across all clinical phases. Results Industry was more likely than non-profit funders to fund large international randomised controlled trials, although methodological differences have been decreasing with time. Among 27 835 completed efficacy trials (phase II-IV), 15 084 (54.2%) had disclosed their findings publicly. Industry was more likely than non-profit trial funders to disseminate trial results (59.3% (10 444/17 627) v 45.3% (4555/10 066)), and large drug companies had higher disclosure rates than small ones (66.7% (7681/11 508) v 45.2% (2763/6119)). Trials funded by the National Institutes of Health (NIH) were disseminated more often than those of other non-profit institutions (60.0% (1451/2417) v 40.6% (3104/7649)). Results of studies funded by large drug companies and NIH were more likely to appear on clinicaltrials.gov than were those from non-profit funders, which were published mainly as journal articles. Trials reporting the use of randomisation were more likely than non-randomised studies to be published in a journal article (6895/19 711 (34.9%) v 1408/7748 (18.2%)), and journal publication rates varied across disease areas, ranging from 42% for autoimmune diseases to 20% for oncology. Conclusions Trial design and dissemination of results vary substantially depending on the type and size of funding institution as well as the disease area under study. To fill this gap, we did the most comprehensive analysis to date of all interventional studies of small molecule and biological therapies registered on clinicaltrials.gov, up to 19 July 2017. We linked trial registry entries to the publication of findings in journal articles and used descriptive statistics, semantic enrichment, and data visualisation methods to investigate and illustrate the landscape and evolution of registered clinical trials. Specifically, we investigated the influence of type of funder and disease area on the design and publication rates of trials across a wide range of medical journals; changes over time; and associations with reported attrition rates in drug development. To facilitate comparison across diverse study characteristics, we designed a novel visualisation method allowing rapid, intuitive inspection of basic trial properties. Our large scale, cross sectional analysis and field synopsis of the current and historical clinical trial landscape used a combination of basic information on trial protocols and published trial results. The developed data processing and integration workflow manipulates and links data from clinicaltrials.gov with information about journal articles in which trial results were published. We downloaded the clinicaltrials.gov database as of 19 July 2017—nearly two decades after the FDA Modernization Act legislation requiring trial registration.8 The primary dataset encompassed 249 904 studies. We then identified records of all pharmaceutical and biopharmaceutical trials, defined as clinical studies evaluating small molecule drugs, biological drugs, adjuvants, and vaccines.27 To extract the relevant subset, we restricted the “study type” field to “interventional” and the “intervention type” to either “drug” or “biological.” This led to a set of 119 840 clinical trials with a range of organisations, disease areas, and design characteristics (supplementary file 1). To categorise clinical trials by medical specialty, we mapped reported names of disease conditions to corresponding medical subject headings (MeSH) terms (from both MeSH Thesaurus and MeSH Supplementary Concept Records)29 by using a dictionary based named entity recognition approach.30 A total of 21 884 distinct condition terms were annotated with MeSH identifiers, accounting for 86.4% of all disease names from 88% of the clinical trials (supplementary file 2). The mapping enabled normalisation of various synonyms to preferred disease names, as well as automatic classification of diseases into distinct categories using the MeSH hierarchy. To compare our results with previously published clinical trial success rates, we focused on seven major disease areas investigated in the study by Hay et al31: oncology, neurology, and autoimmune, endocrine, respiratory, cardiovascular, and infectious diseases. We mapped trial conditions annotated with MeSH terms to these categories on the basis of matching terms from levels 2 and 3 of the MeSH term hierarchy; see supplementary file 2 for details on MeSH term assignment and disease category mapping. To categorise studies by type of funder, we first extended the agency classification available from clinicaltrials.gov. Specifically, we used two main categories (industry and non-profit organisations) and four sub-categories (big pharma, small pharma, National Institutes of Health (NIH), and other); the “other” category corresponded to universities, hospitals, and other non-profit research organisations.3233 We classified industrial organisations as “big pharma” or “small pharma” on the basis of their sales in 2016 as well as the overall number of registered trials they sponsored. Specifically, we classed an industrial organisation as big pharma if it featured on the list of 50 companies from the 2016 Pharmaceutical Executive ranking or if it sponsored more than 100 clinical trials34; otherwise, we classified it as small pharma (see supplementary file 2). 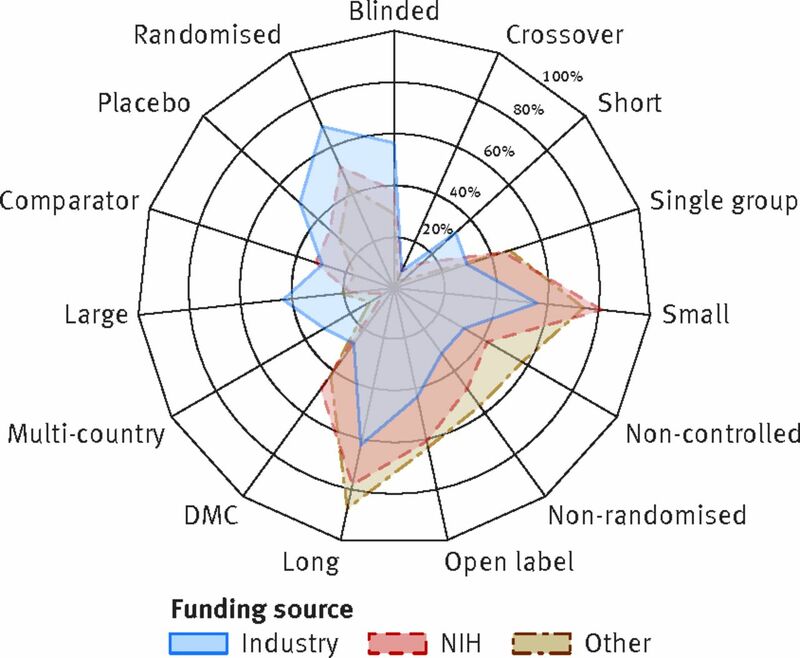 Next, we derived the likely source of funding for each trial based on the “lead_sponsor” and “collaborators” data fields, using a previously described method extended to include the distinction between big and small commercial organisations.16 Briefly, if NIH was listed either as the lead sponsor of a trial or a collaborator, we classified the study as NIH funded. If NIH was not involved, but either the lead sponsor or a collaborator was from industry, we classified the study as funded by either big pharma if it included any big pharma organisation or otherwise as small pharma. Remaining studies were assigned “other” as the funding source. We linked the trial registry records to the disclosed results, either deposited directly on clinicaltrials.gov or published as a journal article, to establish whether the results of a particular trial had been disseminated. We implemented the approach described by Powell-Smith and Goldacre to identify eligible trials that should have publicly disclosed results.20 These were studies concluded after January 2006 and by July 2015 (to allow sufficient time for publication of results of studies that had not filed an application to delay submission of the results (based on the “first_received_results_disposition_date” field in the registry).20 We included studies from all organisations (even minor institutions) regardless of how many trials they funded. The selection process led to a dataset of 45 620 studies, including 27 835 efficacy trials (phase II-IV), summarised by the flow diagram in supplementary file 1. For each eligible trial, we used two methods to search for published results. Firstly, we searched for structured reports submitted directly to the results database of clinicaltrials.gov (based on the “clinical_results” field). Next, we queried the PubMed database with NCT numbers of eligible trials, using an approach that involves searching for the NCT number in the title, abstract, and “secondary source ID” field of PubMed indexed articles.203536 To exclude study protocols, commentaries, and other non-relevant publication types, we used the broad “therapy” filter—a standard validated PubMed search filter for clinical queries37—as well as simple keyword matching for “study protocol” in publication titles.20 In addition, we excluded articles published before trial completion. We then determined the proportion of publicly disseminated trial reports for the studies covered by mandate for submission of results (efficacy trials: phase II-IV), as well as for all completed drug trials including those not covered by the FDA Amendment Act (phase 0-I trials and studies with phase set to “n/a”).9 In addition to result dissemination rate, we calculated the dissemination lag for individual studies to determine the proportion of reports disclosed within the required 12 months after completion of a trial. We defined dissemination lag as time between study completion and first public disclosure of the results (whether through submission to clinicaltrials.gov or publication in a journal). To investigate the relation between characteristics of published trials and quality metrics of scientific journals, we classified journals as high or low impact based on journal metrics information from SCImago Journal and Country Rank, a publicly available resource that includes journal quality indicators developed from the information contained in the Scopus database (www.scimagojr.com). Specifically, we classified a journal as high impact if its 2016 H-index was larger than 400 and as low impact if its H-index was below 50. We examined the study protocol data for 15 characteristics available from clinicaltrials.gov and from our derived annotations. These were randomisation, interventional study design (for example, parallel assignment, sequential assignment, or crossover studies), masking (open label, single blinded, double blinded studies), enrolment (total number of participants in completed studies or estimated number of participants for ongoing studies), arm types (placebo or active comparator), duration, number of outcomes (clinical endpoints), number of eligibility criteria, study phase, funding source, disease category, countries, number of locations, publication of results, and reported use of data monitoring committees. Further explanation and definitions of trial properties are available in supplementary file 2. We used descriptive statistics and data visualisation methods to characterise trial categories. We report frequencies and percentages for categorical data and use medians and interquartile ranges for continuous variables. 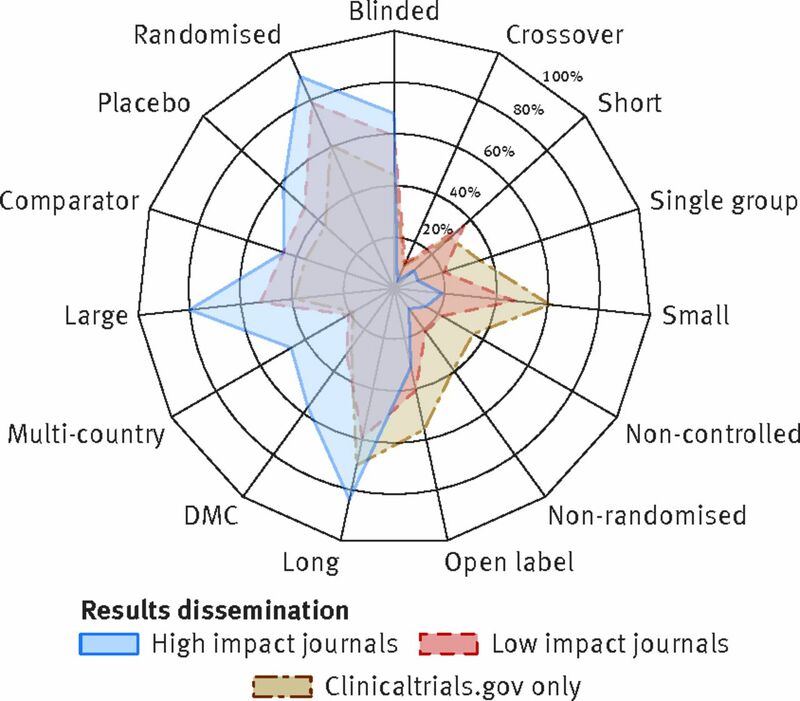 To visualise multiple features of clinical trial design, we used radar plots with each axis showing the fraction of trials with a different property, such as reported use of randomisation, blinding, or active comparators. We converted three continuous variables to binary categories: we classified trials as “small” if they enrolled fewer than 100 participants, as “short” if they lasted less than 365 days, and as “multi-country” if trial recruitment centres were in more than one country. Further details are available in supplementary tables. To facilitate comparisons between several radar plots, we always standardised the order and length of axes. We used Python for all data analysis tasks (scikit-learn, pandas, scipy, and numpy libraries), working with geographical data (geonamescache, geopy, and Basemap libraries), as well as for data processing and visualisation (matplotlib, Basemap, and seaborn libraries). Patients were not involved in any aspect of the study design or conduct or in the development of the research question. The study is an analysis of existing publicly available data, so there was no active patient recruitment for data collection. To date, 119 840 drug trials have been registered with clinicaltrials.gov. As illustrated by figure 1 (left), the distribution of trials funded by different types of organisations has changed over time. In particular, the proportion of studies funded by organisations other than industry or NIH has increased—mainly universities, hospitals, and other academic and non-profit agencies, classified here as “other.” Overall, these institutions funded 36% (43 431) of all registered pharmaceutical trials, followed by big pharma with 31% (36 912), and small pharma with 21% (25 216) of studies. NIH funded 11% (13 426) of registered pharmaceutical trials (fig 1, right). Among the 10 main study funders ranked by the overall number of trials, two belonged to the NIH category (National Cancer Institute leading with 7219 trials) and eight to the big pharma category (GlaxoSmithKline at the top with 3171 trials). Of 4914 small pharma organisations, 3615 (73.6%) had fewer than five trials, and 2119 (43.1%) funded only one study. Similarly, among the 6468 funders classified as “other,” 5124 (79.2%) had fewer than five trials, and 3630 (56.1%) funded only one study. The approach outlined in the Methods section identified 45 620 clinical trials in our dataset that should also have available published results. The remaining analysis in the Results section focuses on this subset of studies. The dataset included various types of study designs from large randomised clinical trials to small single site studies, many of which lacked controls (supplementary file 2). Comparative analysis showed that methodological characteristics of trials varied substantially across clinical phases (fig 2, left), disease areas (fig 2, right), and funding source (fig 3). The next section will focus on a comparative analysis by funder type, and a detailed overview of differences across phases and diseases is available in supplementary file 2. Industrial organisations were more likely to fund large international trials and more often reported the use of randomisation, controls, and blinding, compared with non-industrial funders. Although differences were evident across all clinical phases (supplementary file 2), the largest variability was observed for phase II trials, illustrated by figure 3. For instance, 4956 (68.5%) of all 7236 phase II trials funded by industry were randomised (compared with 39.4% (661/1677) of studies funded by NIH and 50.6% (1283/2535) funded by other institutions). Studies with industrial funding were also substantially larger (median 80 patients compared with 43 and 48, respectively) and more likely to include international locations (31.3% (n=2265) for industry versus 11.0% (184) for NIH and 4.0% (101) for others). Despite larger enrolment size, industry funded studies were on average shorter than trials by other funders (median 547 days compared with 1431 days for NIH and 941 for others). Non-industrial funders were more likely to report the use of data monitoring committees: 702 (41.9%) of trials with NIH funding and 1219 (48.1%) of studies funded by other organisations involved data monitoring committees compared with 1935 (26.7%) of trials funded by industry. Design characteristics did not differ substantially between trials funded by big and small pharma (supplementary file 2). Trial design changed substantially over time, with the trends most evident in phase II. As shown in figure 4, the methodological differences between industry and non-industrial funders have generally decreased over time. 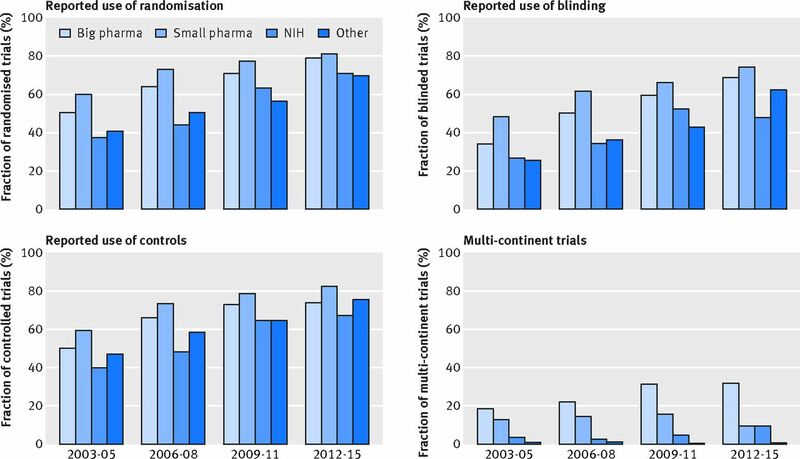 Although a higher proportion of industry led studies reported the use of randomisation overall, the proportion of randomised clinical trials funded by non-profit organisations in phase II has recently increased (fig 4). Notably, the use of blinding is still much lower in non-commercial than commercial trials. Additional analysis showed that the average numbers of trial eligibility criteria and outcome measures have increased over time, leading to a greater number of procedures performed in an average study, and hence to an increase in complexity of trials (supplementary file 2). Of the 45 620 completed trials, 27 835 were efficacy studies in phases II-IV covered by the mandate for results publication (supplementary file 1). Of these, only 15 084 (54.2%) have disclosed their results publicly. Consistent with previously reported trends,3839 dissemination rates were lower for earlier clinical phases (not covered by the publication mandate), as only 23.4% (2504/10 691) of trials in phases 0-I had publicly disclosed results (supplementary file 2). Detailed analysis of phase II-IV trials showed that only 3822 (25.2%) of published studies disclosed their results within the required period of 12 months after completion. The median time to first public reporting, whether through direct submission to clinicaltrials.gov or publication in a journal, was 18.6 months. Dissemination lag was smaller for results submitted to clinicaltrials.gov (median 15.3 months) than for results published in a journal (median 23.9 months). Of 27 835 phase II-IV studies, 10 554 (37.9%) disclosed the results through structured submission to clinicaltrials.gov, 8338 (29.95%) through a journal article, and 3808 (13.7%) through both resources. Scientific articles were published in 1454 titles of diverse nature and varying impact factor. These ranged from prestigious general medical journals (BMJ, JAMA, Lancet, New England Journal of Medicine) to narrower focus, specialist journals with no impact information available. Journal publication status depended on study design. Trials reporting the use of randomisation were more likely to be published than non-randomised studies (35.0% (6895/19 711) v 18.2% (1408/7748)), and large trials enrolling more than 100 participants were more likely to be published than studies with less than 100 participants (39.3% (5541/14 106) v 20.5% (2753/13 422)). In general, studies whose results were disclosed in the form of a scientific publication were more likely to follow the ideal randomised clinical trial design paradigms than were those whose results were submitted to clinicaltrials.gov only (fig 5). A similar trend was observed for trials with results published in higher versus lower impact journals. For instance, 89.6% (1009/1126) of trials published in journals with an H-index above 400 reported the use of randomisation, compared with 79.0% (1223/1548) of trials published in journals with an H index below 50 and 60.7% (5459/8999) of trials whose results were submitted to clinicaltrials.gov only (fig 5 and supplementary file 3). The characteristics of trials disclosed solely through submission to clinicaltrials.gov did not substantially differ from those not disseminated in any form (supplementary files 2 and 3). Trial dissemination rates varied among the different funding source categories (table 2 in supplementary file 2). In general, industry funded studies were more likely to disclose results than were non-commercial trials (59.3% (10 444/17 627) v 45.3% (4555/10 066)) of all completed phase II-IV studies). They were also more likely to report the results on clinicaltrials.gov (45.6% (8041) v 24.4% (2457)) and had a shorter time to reporting (median 14.5 v 18.0 months). Notably, only a small difference was observed for journal publication rates (31.0% (5460) v 28.1% (2827)). Additional analysis showed substantial differences across more granular funder categories (fig 6, top left). Among non-profit funders, a gap existed between NIH funded studies and those funded by other academic and non-profit organisations, with 60.0% (1451/2417) and 40.6% (3104/7649) of trials being disclosed from the two categories, respectively. Similarly, among the industry funded clinical trials, big pharma had a higher result dissemination rate than small pharma (66.7% (7681/11 508) v 45.2% (2763/6119) of studies); see table 2 in supplementary file 2 for details. In addition to overall reporting rates, the analysis also highlighted differences in the nature and timing of dissemination of results across trial funding sources (fig 6). Big pharma had the highest dissemination rate, both in terms of clinicaltrials.gov submission (53.2% (6122/11 508) of studies) and journal publications (34.8% (4005)). By contrast, funders classified as “other” showed the lowest percentage of trials published on clinicaltrials.gov (15.9% (1214/7649)). Organisations from this category disclosed trial results primarily through journal articles (29.1% (2229) of all studies) and were the only funder type with fewer trials reported through clinicaltrials.gov submission than through journal publication. 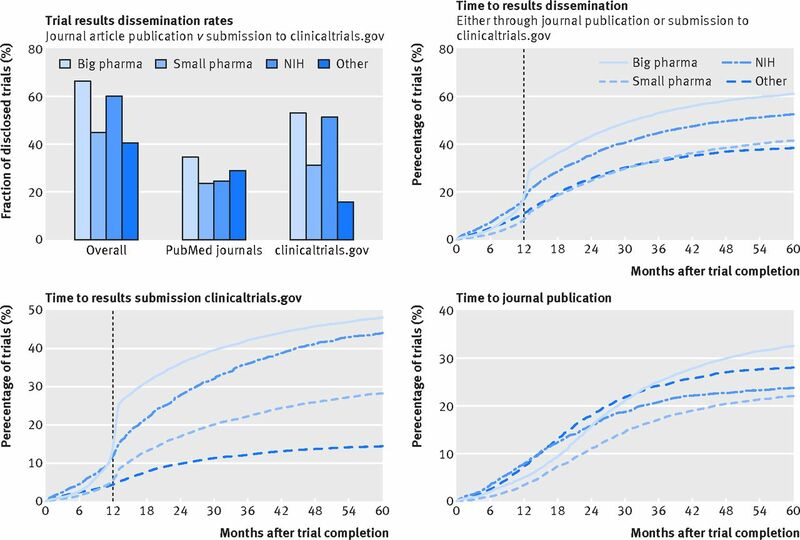 The time to reporting trials at clinicaltrials.gov was fastest for industry funded trials and slowest for studies funded by organisations classed as “other;” publication lag for journal articles showed a reverse profile (see figure 6, bottom left and right, and table 2 in supplementary file 2 for detailed statistics). Analysis of the fraction of trials with results disclosed within the required 12 months after completion showed that dissemination rates have been steadily growing with time, with the largest increase observed after 2007, when the FDA Amendments Act came into effect.9 Further analysis showed that the observed growth was largely driven by increased timely reporting on clinicaltrials.gov, most evident for studies funded by big pharma and NIH (supplementary file 2). 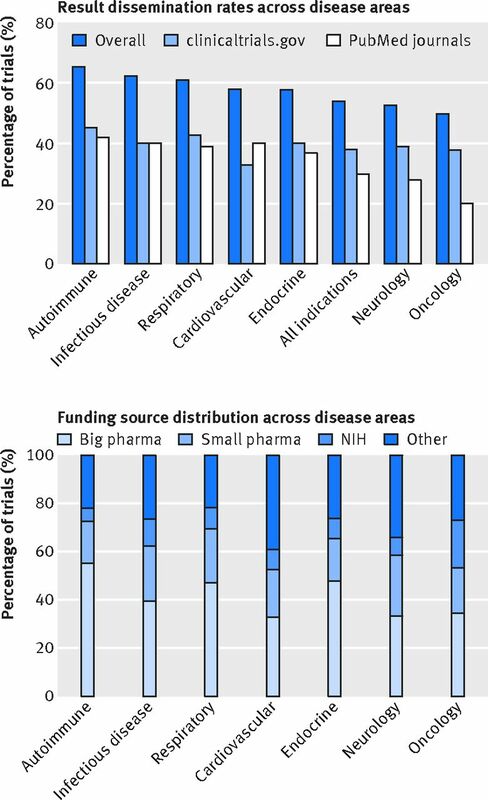 Disease areas with highest dissemination of results were autoimmune diseases and infectious diseases, whereas neurology and oncology showed the lowest dissemination rates (fig 7). As shown on the left side of figure 7, these differences were largely driven by differential trends in journal publication, with less variability observed for rates of result reporting on clinicaltrials.gov. Oncology in particular had consistently the lowest journal publication rate across all clinical phases and funder categories. This analysis, enabled by automated data driven analytics, provided several important insights on the scope of research activity and the design, visibility, and reporting of clinical trials of drugs. Trial activity has grown and diversified, with a more diverse range of profit and non-profit organisations undertaking clinical research across a wide range of disease areas, and the analysis highlighted potentially important differences in the quality and dissemination of trials. In terms of trial design, industry funded studies tended to use more robust methods than studies funded by non-profit institutions, although the methodological differences have been decreasing with time. Rates of dissemination of results varied substantially depending on the disease area as well as the type and size of funding institution. In general, the results of industry funded trials were more likely to be disclosed compared with non-commercial studies, although small drug companies lagged behind “big pharma.” Similarly, trials with NIH funding more often disclosed their results than did those funded by other academic and non-profit organisations. Although overall dissemination rates have improved with time, the trend was largely driven by increased reporting of results on clinicaltrials.gov for big pharma and NIH funded studies. By contrast, the results of trials funded by other academic and non-profit organisations were primarily published as journal articles and were rarely submitted to clinicaltrials.gov. Finally, differences in dissemination rates across medical specialties were mainly due to differential journal publication rates ranging from 42% for autoimmune diseases to 20% for oncology. One of the major strengths of this work is the larger volume of clinical trials data and the greater depth and detail of the analysis compared with previous studies in this area. Many factors were analysed for the first time in the context of both quality of trial design and transparency of research. These included the distinction between big pharma and smaller industrial organisations, analysis of publication trends across distinct medical specialties, and differences between trials whose results were disseminated through submission to clinicaltrials.gov and publication in higher or lower impact journals. In addition, the study provided a novel method for visualising the characteristics of trials, which enables a rapid assimilation of similarities and differences across a variety of factors. The study had several limitations related to the underlying dataset and the methods used to annotate and integrate the data. Firstly, it was limited to the clinicaltrials.gov database and hence did not include unregistered studies. However, given that registration of trials has been widely accepted and enforced by regulators and journal editors,812 most of the influential studies will probably have been captured in the analysis.40 Additional limitations were due to data quality factors such as missing or incorrect entries, ambiguous terminology, and lack of semantic standardisation.1416 Many trials were annotated as placebo or comparator controlled on the basis of information mined from their unstructured titles and descriptions, as the correct annotation in the structured “arm type” field was often missing. Although we analysed a subset of annotations manually, our automatic workflow might still have misclassified some trials. In addition, owing to the non-standardised free text format of the data, we used only a simple count of eligibility criteria and outcome measures as an imperfect proxy for assessing the complexity of trials and the homogeneity of enrolled population. Our study suggests that the FDA mandate for dissemination of trial results and the establishment of the clinicaltrials.gov results database led to improved transparency of clinical research. The time to dissemination of results is shorter for clinicaltrials.gov than for traditional publication, and the database stores the results of many otherwise unpublished studies. Lack of journal publications might be explained by the reluctance of editors to publish smaller studies based on suboptimal design or studies with “negative” or non-significant outcomes that are unlikely to influence clinical practice.415556 Our analysis showed that journal publication varied depending on trial design and disease area, with certain medical specialties and smaller non-randomised studies more likely to be disseminated solely through clinicaltrials.gov. The difference was particularly evident for oncology. Only a fifth of completed cancer trials were published in a journal, perhaps owing to the high prevalence of small sample sizes, suboptimal trial designs, and negative outcomes in this field.1431 High rates of dissemination on clinicaltrials.gov, including for cancer trials and small studies, suggests that this resource plays an important role in reducing publication bias. Thus, to assure better completeness of available evidence, the database should be used by clinical and drug discovery researchers in addition to literature reviews. We thank our colleagues from BenevolentAI, University College London, and Farr Institute of Health Informatics for much useful discussion and advice, particularly John Overington (currently Medicines Discovery Catapult), Nikki Robas, Bryn Williams-Jones, Chris Finan, and Peter Cox. We also thank the clinicaltrials.gov team for their assistance and advice. Contributors: MZ, MD, ADH, and JH conceived and designed this study. MZ and MD acquired the data. MZ, MD, ADH, and JH analysed and interpreted the data. The initial manuscript was drafted by MZ; all authors critically revised the manuscript and approved its final version. MZ takes responsibility for the overall integrity of the data and the accuracy of the data analysis and attests that all listed authors meet authorship criteria and that no others meeting the criteria have been omitted. JH is the guarantor. Funding: This study received no specific external funding from any institution in the public, commercial, or not for profit sectors and was conducted by Benevolent Bio as part of its normal business. ADH is supported by the UCL Hospitals NIHR Biomedical Research Centre and is an NIHR senior investigator. Transparency: The manuscript’s guarantor affirms that the manuscript is an honest, accurate, and transparent account of the study being reported; that no important aspects of the study have been omitted; and that any discrepancies from the study as planned (and, if relevant, registered) have been explained. Data sharing: All the data used in the study are available from public resources. The dataset can be made available on request from the corresponding author. US Food & Drug Administration. Food and Drug Administration Modernization Act (FDAMA) of 1997. https://www.fda.gov/RegulatoryInformation/LawsEnforcedbyFDA/SignificantAmendmentstotheFDCAct/FDAMA/default.htm. US Food & Drug Administration. Food and Drug Administration Amendments Act (FDAAA). 2007. https://www.fda.gov/drugs/guidancecomplianceregulatoryinformation/guidances/ucm064998.htm. International Committee of Medical Journal Editors. Clinical trials: registration. http://www.icmje.org/recommendations/browse/publishing-and-editorial-issues/clinical-trial-registration.html. World Health Organization. International Clinical Trials Registry Platform (ICTRP): primary registries. http://www.who.int/ictrp/network/primary/en/. Bradshaw J. Small drug companies grow as big pharma outsources. 2017. http://www.telegraph.co.uk/business/2017/01/22/top-50-privately-owned-pharma-companies-britain/.
. Trends in the globalization of clinical trials. Nat Rev Drug Discov2008;7:13doi:10.1038/nrd2441. ClinicalTrials.gov. Glossary of common site terms. https://clinicaltrials.gov/ct2/about-studies/glossary. ClinicalTrials.gov. ClinicalTrials.gov protocol registration data element definitions for interventional and observational studies. 2017 http://prsinfo.clinicaltrials.gov/definitions.html. Ranking the Brands. Top 50 global pharma companies. 2017. https://www.rankingthebrands.com/The-Brand-Rankings.aspx?rankingID=370. Novartis Public Affairs. Novartis position on clinical study transparency – clinical study registration, results reporting and data sharing. 2016. https://www.novartis.com/sites/www.novartis.com/files/clinical-trial-data-transparency.pdf. Pfizer. Trial data & results. https://www.pfizer.com/science/clinical-trials/trial-data-and-results.
. Data transparency. 2014. https://www.gsk.com/en-gb/behind-the-science/innovation/data-transparency/. National Institutes of Health. NIH policy on the dissemination of NIH-Funded clinical trial information. 2016. https://grants.nih.gov/grants/guide/notice-files/NOT-OD-16-149.html.